I took advantage of a free day during reading week to head down to London to see “Out There: Our Post War Public Art”. Out There is the first exhibition mounted by Historic England, the slimmed down built heritage conservation advisory service, created last year when English Heritage morphed into a charity. Out There presents some of the findings of an ongoing Historic England project to track down and record the fate of examples of “public art” (murals, base carvings and sculptures) commissioned and placed throughout the UK’s public realm between 1945 and 1985. Entering the courtyard of Somerset House from The Strand I was momentarily dazzled by the light of a pleasantly sunny day. A surprisingly large number of people from King’s, from the Courtauld, kids on half term and office workers were sat out enjoying themselves. I followed the signs across the courtyard towards the building’s East Wing Gallery. Merely stating when reading a building that it reflects the ideology of the people and times that created it is architectural criticism at its most glib. Yet, it says a lot that the government of George III felt that its civil servants should be housed in a building that resembles a marginally less tonie version of Blenheim Palace. By contrast once inside the East Gallery a suitably democratic spirit pervaded the exhibition space. This is not to say that the dominant feeling induced by Out There is one of Fabian earnestness, bracing yet stern and worthy. On the contrary, given the playfulness of much of the material on display the mood is if anything wry, knowing, warmly ironic, cheeky almost. Whilst the exhibition will hopefully attract an appropriately wide audience, Historic England have wisely decided that the general historical narrative of post 1945 “welfarism” and the growth of the state is well enough known not to warrant dwelling upon. As such the exhibition begins with a fascinating set of photos, memorabilia and an impressive away of smaller sculptures from the 1951 Festival of Britain. These are contextualised through the judicious use of quotations and wider architectural texts to show how the Festival’s modernist and democratising impulses emerged from the wider post-war cultural zeitgeist. It also neatly illustrates that for the organisers one of the key facets of the Festival’s modernity and appeal to the emerging mass cultures was its impermanence. Out There convincingly suggests that the Festival of Britain, whilst transient in nature, fired a belief amongst taste shapers and funding bodies that there was a strong public appetite for sculpture, murals and carvings. The exhibition shows how in the 1950s, both the emerging Arts Council and certain local authorities prioritised public art in new developments. This ranged from the London County Council’s (LCC) commitment in 1956 to spend £20,000 a year on public art commissions, through the way that Harlow’s planners wove sculpture into the “texture” of the town that they constructed, to the stipulations of the Hertfordshire and Leicestershire LEAs that a small proportion (generally 0.33%) of the capital cost of new schools should be set aside to pay for art work. There was a certain degree of snobbery in the choices made by planners and commissioning bodies, especially in the early years. In the film clips and quotations that the curators have assembled there is a tendency amongst the experts interviewed to stress to “concrete”, “easy to approach and comprehend” nature of the works that they were commissioning, nothing, then, that a straightforward working person would find effete or challenging. The same film clips and assembled local newspaper coverage, suggests that many members of the communities into which sculptures and reliefs were placed did find them alien. What’s striking though, is how public art, however, avant garde, often came to be appreciated, even loved, by the residents of the towns, complexes and estates that it was situated within. Later parts of the exhibition focus poignantly on instances, for instance the case of Henry Moore’s “Old Flo” in Tower Hamlets, where communities in more recent times have campaigned to save or for the restoration of cherished public art works. Today residents of some of the country’s most deprived communities seemingly do really appreciate the works of art that were placed in their communities at this time. The way in which public art was commissioned after 1945 was also more democratic. Whilst a large share of the money set aside by the LCC after 1956 for public art went to well established sculptors like Barbara Hepworth and Henry Moore (who could command fees of £1,000-1,500 a time), dozens of smaller commissions (sometimes for as little as £25 a time) went to lesser known artists. This had the effect of democratising the artistic profession itself, in that a steady stream of public commissions allowed a wider array of individuals to make a living from art. Historic England have uncovered that campaigns to record and preserve Britain’s post-war public art began surprisingly early. As long ago as 1976-77 there was a nascent campaign to produce a comprehensive list of the location and ownership of British public art. The campaign involved writing to local authority architect’s departments and asking them to writing back with the particulars of public art works they had commissioned in their area post 1945. An array of responses received, generally from county architects, from across the country is presented at the exhibition. They make for fascinating reading. Concerns about overwork, funding cuts and the difficulties of co-ordinating multiple stakeholders and interest groups resonate strongly with today’s climate. However, what’s especially striking, is that with a few notable exceptions, Hampshire, Sheffield, Leicestershire the council’s clearly hadn’t keep any kind of central register of what works of art they’d commissioned and where those works of art had ended up. In some cases the council’s claimed that they’d never commissioned any artworks, in others they said that they had, but they were “mostly without merit” and not worth the attention of either scholars or the wider public. In quite a few cases, especially in the Metropolitan Counties and London, the architects pointed to the recent local government reorganisations, arguing that their lists couldn’t be complete because the new councils covered a large number of former local government bodies all of which had had different commissioning priorities. This says two things: one, that by generally concentrating on county level bodies, the campaigners were ignoring the district councils who would have been the principal commissioners of town centre, housing estate and leisure centre arts works and two, that even in the post war era, an enlarged state didn’t automatically lead to better coverage and service provision and reorganisations are always messy. Out There doesn’t only concentrate on publicly commissioned art works, it also explores the public art purchased by industrial firms, retailers like John Lewis, pub companies and third sector organisations like universities and churches. Public art on commercial buildings is often at particular risk, because whilst a crucial part of the public realm, it lies in private hands and can often be swept away when a site is refurbished or redeveloped. Which isn’t to say that publicly owned artworks are necessarily “safer”, as these generally very sad pictures of public artworks in Birmingham, many of them relocated since 2000 from city centre sites undergoing redevelopment; can testify. One of Historic England’s real triumphs has been to uncover the full story of the mystery of the Bullring Gorilla. 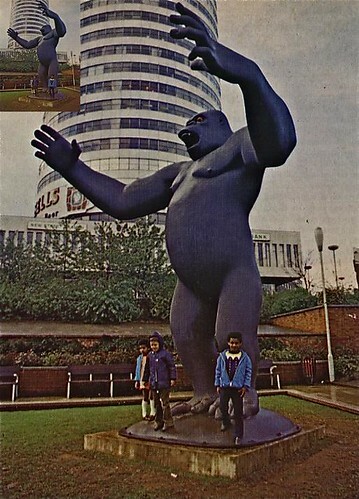 Placed in the now demolished Manzoni Gardens in front of the shopping centre in 1972, the gorilla statue (seemingly a fairly early example of postmodern sculpture, and a wry comment on the “shock” caused by the city’s post 1945 redevelopment) was part of an Arts Council project to place “20 contemporary sculptures” in Britain’s major cities. With a few exceptions (including King Kong), like early generations of post-war sculpture, they weren’t a great hit with the public, at least not initially. One, admittedly somewhat phallic, set of sculptures was denounced by at least one clergyman and suffered an inglorious (albeit appropriately provocative liminal) fate when destroyed by drunken University of Cambridge students during the initial exhibition period. Another sculpture, sited in central Plymouth, had to be removed to Warwick University’s campus for its own safety. Here concerned academics gave it a home, where it remains a much loved part of the university community to this day. King Kong, in common with all the other sculptures, wasn’t purchased by its host local authority at the end of the exhibition period. Birmingham City Council’s loss becoming, by several twists of fortune, Penrith’s gain. The final section of the exhibition deals with the ongoing campaign to record and conserve Britain’s post-war public art. This ranges from community group’s efforts, through high profile architect led campaigns to the efforts of Historic England the C20th Society to trace and record the whereabouts of public art. In instances where a piece has been lost for good they work to try and find photos of it so that they can catalogued and conserved, where it is potentially under threat they put it forward for listing. Despite the sad disdain and neglect that so many of the works on display have suffered since they were commissioned the exhibition is fundamentally an uplifting one. It succeeds in unearthing some amazing finds and shining light on some unjustly forgotten schemes, works and characters. Critically it manages with both rigour and humanity to showcase works of art which brought a splash of thoughtful humanity, complexity and a creative spirit, to frequently overlooked parts of the country. The current political, ideological and fiscal situation aside it’s clear that public art in Britain has a bright future. It was half term when I visited, and a number of children were wandering around the exhibition. They seemed genuinely interested, even enthralled by it all. As a gallery attendant was getting my bag out of a locker I looked across at the visitor’s comment board where one small girl was writing “I really enjoyed this exhibition all the art is really beautiful and should be enjoyed”. I walked back into the cold winter sun, warmed, a slight smile on my face.